Before I start today, I want to congratulate one of the Cardboard Samurai from my Facebook group, Stephen Jackel, on his top 8 of a 130 person PPTQ in Tokyo last weekend. Last weekend I decided to run Kellen Pastore’s Mono-White Humans deck at Hareruya’s PPTQ. I originally intended to play in the PPTQ because I was short 250 Planeswalker points for 1 bye next year and I had hoped to finish 4-X. All of this means that my notes for the tournament are both terrible and non-existent, but instead of the tournament report I was asked to make I will give you my thoughts on how the Standard meta is shaping up in the Tokyo area. I went into the tournament expecting Bant Company to be the deck to beat. I did a 5 round tournament the night before and found Mono-White Humans to be a very explosive deck. However, it quickly dies out if the opponent can stabilize. Unlike similar “Red Deck Wins” decks, fast white decks lack a way to close out the game after your opponent stabilizes the board. This drawback of white means that it needs to hit harder and faster and be willing to sacrifice board presence in order to push through the final few points of damage. Fortunately, the printing of Gryff’s Boon means we can win the game on the back of a reusable flying enchantment. The meta was largely Bant Company which I played against 5 times. I lost to it twice. Once to the eventual winner and once in the quarterfinals. I also had a chance to play against UW humans, Red Eldrazi and R/G Ramp. What I learned playing against Bant Company is that fliers are severely lacking in the current meta with only Avacyn, Ojutai and World Breaker able to deal with it. More than once I pushed a Gideon through on turn 3 with a Gryff’s Boon, flipped it, and was still able to play a 2 drop or a Declaration in Stone afterwards. I could later re-enchant the Gideon for a 5 point attack to win the game. If I was to play the tournament again with what I know now I would have dropped the 2 Stasis Snares for more 1 drop creatures and I would have added a 4th Gryff’s Boon. I felt that Hanweir Militia Captain underperformed and quickly became a lightning rod for Reflector mage. Creatures in this meta need to be able to impact the board with enter the battlefield effects or be cheap enough to reduce tempo loss against Reflector mages to be worth playing. Mono-White Humans does a great job of checking off all of these boxes with cards like Knight of the White Orchid, Thalia’s Lieutenant and Kytheon, Hero of Akros. Overall this deck over performed this weekend by going wide and high against the army of Bant Company and I would gladly play it again against a similar field. You can hover over the deck lists to see the cards used in each deck if you want to as well, though it might take some time to do so. As you can see, the tournament was absolutely dominated by Bant Company. It made up 50% of the top 8 and Stephen said the deck was all over the room during the tournament. Last weekend there were also 2 PPTQs in Nagoya, Japan which I took part in. The first one was a 51 person tournament on Saturday, and the second one was on Sunday. There were 67 players at the Sunday tournament, and while these tournaments weren’t as big as the Tokyo one, they help to add to the sample size and make it easier to see the metagame as a whole. The winner of this tournament was Temur midrange, which used a mix of Dragons, Woodland Wanderer, and Reality Smasher to put together a potent force of both flyers and difficult beaters on the ground. Key cards for the deck were Deathcap Cultivator which ramped the 4 drop creatures out early as well as making Wanderer a 6/6 trampler on occasion. The list can be seen above in the link for the deck. Other interesting decks were Abzan aristocrats which used the Brood Monitor/Eldrazi Displacer combo with a Zulaport Cuthroat in play to go infinite damage/life, and a BW Aristocrats that was incredibly efficient at playing threats, getting tokens, and finishing an opponent with cards like Avacyn and Gideon. I was also surprised that 2 Jund decks made the top 8, but they did seem to have just the right removal package for the tournament and some great finishers to take over the game with. I lost to a GB Gitrog Monster deck myself at this tournament. The new 6/6 Legendary Frog gives you a lot of card advantage which is just what a control/midrange deck needs to take over a game. While fellow grinder Inui Takashi and Bant Company player ended up taking down this event and dominating the top tables most of the day, there was no shortage of viable, competitive decks in the top 8. The BW aristocrats deck that I faced the day before made the top 8 again but ended up being able to reach first place, and even Esper Dragons got a shot at the big prize. I really liked the BW Eldrazi deck that showed up though. Declaration in Stone and Anguished Unmaking give this deck some great new removal, and both of these cards are made even better with Wasteland Strangler which acts as extra removal on top of a 3/2 creature. The deck blinks the Strangler with Displacer at any point during the game and lets you continuously give -3/-2 triggers to creatures as long as exiled cards are available. I find this deck incredibly intuitive and very deep. Between the removal and creatures, there are a total of 14 exile effects, and if you blink your Thought Knot Seers the possibilities are endless. This is a very impressive deck that I think will be a tier 1 deck going forward. It just needs a little bit more tweaking for the metagame. A crash course can mean one of two things. The first definition is that you’re in some kind of vessel that is on a collision course with another object which you will eventually hit. The other meaning is in regards to learning something difficult in a very short time using mainly the most important points. Both aren’t good things, and my results this last weekend could be summed up as a crash course in the Shadows Over Innistrad metagame. As you know I don’t have a lot of time to play standard during the week anymore due to work which leaves me only with Saturday and Sunday to play. My other problem is that I don’t own or have the income to purchase cards like Avacyn ($65 in Nagoya, Japan) or Jace, Vryn’s Prodigy ($90-100). I was also handicapped by not being able to play cards like Declaration in Stone (currently $25-30) so I had to make due with less than stellar choices for both creatures and removal. I had some decks I had tested at smaller events during the week that seemed to have potential but didn’t have the optimization, synergy, or power level needed finish my opponents. On Saturday I played a new version of my GR Elemental/Landfall deck and thought I was doing well after 2 wins in a row in rounds 1 and 2 against UW Humans and GR Eldrazi ramp, but I somehow managed to lose 4 games in a row afterwards to take away any chance at a top 8 appearance. My first loss was to BW Aristocrats (eventual top 8 deck). This was my first time playing the deck and after seeing a Gideon, Ayli, and Avacyn game 1 I sided in thinking it was a Midrange deck. However, once my opponent played 2 Zulaport Cutthroats, Nantuko Husk, and Carrier Thralls in game 2 I knew I was in trouble. He quickly whittled down my life and managed to combo out for the win for 16 damage in a turn. In round 4 I faced a red/white Eldrazi deck but wasn’t able to effectively deal with his Reality Smasher and Vile Aggregate so I lost. I was more prepared for humans than Eldrazi, so I didn’t have a lot of effects in GR that could deal 5 damage to kill those types of creatures. At 2-2 I still had a slim chance of making the top 8, but in round 5 I went up against a GB Gitrog Monster midrange deck and lost due my opponent’s overwhelming card advantage. He had tons of removal for my threats and attacked with Mindwrack Demon in the air which didn’t leave me with many options. In round 6 I played against Bant Company and came incredibly close to beating my opponent but couldn’t finish him off in the late game. This was my first major outing with the deck and although I didn’t have the experience with the deck to perform well I feel like the deck has a lot of potential. I made a few changes to the deck and it’s been testing rather well so far in gold fishing and in playtest sessions. What made this deck explosive in OGW standard was its access to fetchlands. Being able to trigger Embodiment of Fury or a card like Grove Rumbler multiple times was pretty important. This new version of the deck however goes for more of a midrange strategy with a huge top end. Deathcap Cultivator has taken over the role of Rattleclaw Mystic rather well, even if you can’t flip it for big turn 4s to power out a 6 mana spell. The access to black makes Radiant Flames viable against aggro decks from your sideboard, and it also gives you a way to activate Hissing Quagmire. The ramp package of Pilgrimage and Explosive Vegetation is still the same, but the removal is slightly different. Roast was good in a Siege Rhino/Anafenza meta, but not in an Avacyn/Mindwrack Demon meta. While Lightning Axe puts you at a disadvantage, having access to a way to shut down a big threat is important. Another great addition to this deck is Ulvenwald Hydra. It’s an absolutely huge creature in this deck that gives you a Fury activation if you have land to attack with, but it’s reach is also incredibly important. It shuts down even Dragonlord Atarka once you untap with it turn 7 and play your land. I also like it as a way to tutor for Hissing Quagmire late in the game to give you some reach with Sylvan Advocate in play. 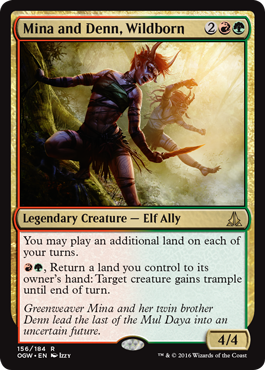 While the deck lacks the extra fetches from the previous standard, Mina and Denn do a great job of keeping the landfall coming. I’ve been rather impressed with it as a turn 3 play off of Cultivator as it helps me to ramp as well as to make my finishers dangerous. A 7/7 hydra with Reach isn’t as scary as a 7/7 Hydra with Reach and Trample. 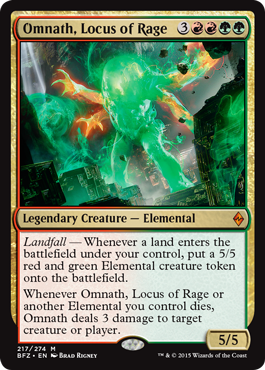 Another card that I think has gotten MUCH better after rotation is Omnath, Locus of Rage. I have YET to lose a game with him once he’s hit the battlefield and gotten at least one landfall trigger to get a 5/5 elemental. Omnath is an absolute monster in this metagame and if your opponent can’t kill him the turn you play him it’s pretty much game over. He turns Embodiment of Fury and its landfall/elemental land creatures into missiles that hit for 3 damage no matter what, and also works well with Ashaya, the Awoken World tokens that Nissa makes. After my 2-4 Saturday PPTQ finish I made some changes to make the deck more competitive against the decks I lost to. For starters, I added in a 3rd Ulvenwald Hydra. This should help considerably against Avacyn/Demon based decks and also stop Dragon midrange decks. It also gives me another finisher to an already powerful deck. To do this, I dropped my 3rd Nissa. While Nissa is a great way to get card advantage and extra landfall triggers, she died rather easily and was hard to protect half the time. I think 2 is the right number. In the sideboard I added in 2 Roast instead of Fiery Impulse I had before. The extra mana and sorcery speed is worth it for 2-3 more damage that I can use to kill a Sylvan Advocate or Reality Smasher. If there were more human decks I’d rather have the Impulse, but against the current meta I like Roast in the sideboard. I also added in Zendikar’s Roil in the sideboard, and this is mostly a nod against decks like Bant Company that can bounce your threats or tap them down. It’s also good against BW decks that have a lot of removal at their disposal. As long as you can keep the landfall coming (which you can with Mina and Denn) you should have enough blockers to keep your opponent at bay. The last card I added to the SB was Pulse of Murasa. Black decks are a pain, but none more so than Aristocrats and GB midrange. These decks are quick to kill your threats and also can reduce you life total quickly. I figure Pulse of Murasa takes care of both of those problems. As for the other card sin the SB, Gaea’s Revenge is for control deck and black midrange, Burn From Within is for control and Eldrazi decks, Clip Wings are for taking out Avacyn, Mindwrack Demon, and Westvale Abbey, and Radiant Flames is for aggro decks like humans and Bant Company. Having a mediocre finish on Saturday led me to try out a different deck on Sunday. I switched from GR Elemental deck to a RW Token deck thinking that the number of tokens I could make would quickly overwhelm my opponent’s removal and allow me to activate Westvale Abbey quickly and consistently. While the idea was sound, a few poor card choices in both the mainboard and sideboard led to another disappointing 2-4 record at that day’s PPTQ. In round one I faced a BW Planeswalker control deck and did really good the first game but ended up getting wiped out by Languish and Planar Outburst while Gideon and Sorin finished me in games 2 and 3. In game 2 I had problems with flyers in Jeskai Dragons and had no way to deal effectively with Ojutai and Thunderbreak Dragon. I had Planar Outburst in the sideboard but never drew it. My third opponent was the most frustrating one the entire day though. Playing Esper control, my opponent took 3-4 minutes a turn and didn’t finish me off in game 1 until 30 minutes had already passed. We ended up tying in game 2 due to his slow play but he ended up winning. I continually asked him to play faster but it simply flustered him and made him take longer. I was at the bottom of the rankings by game 4 but I ended up winning my next two matches against Temur beat Down and GW Eldrazi ramp. I didn’t really care at 2-3 what happened the rest of the day, I simply wanted to get some practice with the deck and see what the metagame was like. In round 6 I lost to Abzan Company thanks to Avacyn wiping my board and Abbey killing me in another game, and in round 7 I lost to UR Goggles that wiped me out time and time again with both Chandra and Thing in the Ice. My biggest problems with the initial build of the deck was that it was too slow. I couldn’t get critical mass quickly enough to activate Westvale Abbey and cards like Hangarback Walker were a poor choice with a Kalitas/Declaration in Stone heavy metagame. While I had planned to get around this with certain cards, it didn’t work out as well as I planned and I never ended up getting good value from the card. My new, reworked deck has addressed these shortcomings though and I think it will perform rather well in the future. It might not be a Tier 1 deck, but I think it can compete as a tier 2 deck consistently. First off, I want to say that Roast and Lightning Axe are only in this build because of financial restrictions. Optimally, I’d like to have a playset of Declaration in Stone and perhaps a 4th Pious Evangel, but until I can afford it I think I can make do with the Axe/Roast combination. I made quite a few changes to my previous build. The first was adding in 2 Stone Quarry. The deck had some mulligan issues because I couldn’t get the color I needed, so going up to more multi-color sources should fix that. The next additions were that of Dragon Fodder and Reckless Bushwhacker. Fodder took over for Hangarback Walker and helps me have a larger board presence more quickly while making it easier to flip both Militia Captain and Westvale Abbey. It also let me go wider with my attacks, especially if I could follow up a Fodder with Bushwhacker to give everybody haste and an attack bonus. Bushwhacker has tested well so far in a few play testing games I’ve tried it in (special thanks to my friend Chris for suggesting it). The other change I made was dropping Retreat to Emeria. I thought it would work well to boost my team’s power or keep me with a steady source of tokens, but it was rather inconsistent. Instead, I went up to 4 Gideon and 4 Secure the Waste. This should make for more consistent blow outs of Waste into Gideon emblem combos and improve my win percentage against control or slow midrange decks that don’t have answers for tokens at instant speed. In the sideboard I made quite a few changes. The first is the addition of Nahiri instead of having her in the mainboard. She seems better against midrange with a few big threats or against Eldrazi than most of the Human/Company decks out there. Hangarback Walker is a better fit in the SB as well. The card is good against removal heavy decks, but it’s slow and unwieldy at times. I’d bring it in against non-white decks like UR as well as aggro decks that can’t bounce it or exile it. Impact Tremors is a card that will have a bigger effect against control decks than anything else I can think of. If won’t matter if your opponent bounces your tokens with Thing in the Ice or keeps them from living with Virulent Plague. They’ll still enter the battlefield and deal that damage. Decks like UR that have no life gain will have a tough time of dealing with the card. Bant Company is sure to makeup a large percentage of the metagame come Friday/Saturday at the Pro Tour, but after two weeks of results you can be sure that the pros will be ready for the “3 mana or less” menace. I except a well rounded control deck to come out of it, most likely in BW and also perhaps an optimized UR Goggles deck. BW has a lot of great cards and has put up very good numbers in tournaments. Yes the deck hasn’t shown up in the Top 8 that much yet, but it will be there soon. White and Black are some of the clear winners after rotation, and with cards like Declaration in Stone in white decks, it will have access to the best removal in the metagame and a solid finisher like Sorin, Grim Nemesis. I expect GB decks to do well too, mostly on the back of black’s removal suite and the 1-2 combination of Mindwrack Demon and the Gitrog Monster. The demon is a fast beater that is hard to block and The Gitrog Monster gives you a lot of card advantage in the right build. Another deck I’ve been keeping my eye on is GW humans. Sigarda seems like a great card for protecting your creatures from Reflector Mage and Anguished Unmaking while also blocking Avacyn in the air. I don’t expect the deck to make the top 8, but I think Sigarda will get a decent amount of airtime this weekend. The last deck that I think will sneak into the top tables at Pro Tour Shadows Over Innistrad is Aristocrats. The deck still has a lot of ways to reach critical mass, even after Rally the Ancestors rotated. As long as Nantuko Husk and Zulaport Cutthroat are in the same standard together the deck will survive. SOI adds redundancy to the deck with cards like Pious Evangel, and cards like Archangel Avacyn allow you to both play a defensive and offensive game. You can flip her to wipe your board and activate multiple Zulaport triggers, or flash her in to protect one of your key cards from destruction. Both the BW and Abzan builds of the deck seem solid, and I wouldn’t be surprised to see a few of these decks make the cut for day 2.